Alastair is a serf, toiling in the lands of his lord. Each day the blue orb of Earth rises on the horizon, whispering of the ancient time of magic when mankind traveled the night sky, but that time is long past and he is content with his lot. Until his beloved Lynessa is struck with the dreaded curse – a mark on the skin that brings certain death. When Alastair hears the legend of an artifact from the time of magic that can lift the curse, he leaves his lord’s lands and journeys to the Argyre Planitia in search of a fabled cure. But the dense jungles there contain unthinkable creatures, remnants engineered from a time long ago, and a tribe of warriors who will stop at nothing to protect the artifact. 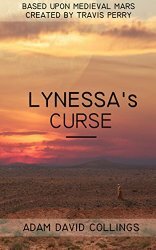 Lynessa’s Curse is a novella originally published in Medieval Mars: The Anthology (Terraformed Interplanetary Book 1) created by Travis Perry. Begin your epic journey on the Red Planet today! Lynessa’s Curse is one very enjoyable tale. I instantly liked the character of Alistair and Waleran, the two main characters. Alistair is the love-stricken serf who proves that he will do anything out of love for Lynessa and it is this that forms the main thrust of the story. Lynessa has contracted an illness that the community regard as a curse from God and these cursed are segregated to their own community, left alone to die the horrible/painful death that this curse brings. It is this that further motivates Alistair to not give up on Lynessa; it is not only his love for her but his bitterness and disillusionment towards God, who would allow this to happen to his beloved, that he sets out to find a cure so he can Lynessa restored and prove God wrong. I loved the mythology of this story. The backstory of the highly technological age that created the terraformed Mars that is now known as The Age of Magic has a certain mystique to it and throughout the novel I found this more and more intriguing especially when part of the cure for this curse is to be found in this past technology. It was certainly beneficial on my part to have watched the video created by Collings where he describes the background to this mythology and backstory and more of the previously mentioned anthology. For a short story, Collings has created some good world building within this backdrop of a terraformed Mars and its mythology. This really does form a solid foundation for this short. I would have loved to have seen more of this world building and the backstory to how Mars was terraformed and what caused the silence over the universe that caused this Earth colony on Mars to be cut off from Earth and plunged into a Medieval world. This really caught my imagination seeing that the recent movie, The Martian, and a news story outlining how Mars would never be inhabitable is the opposite to this anthology’s premise. 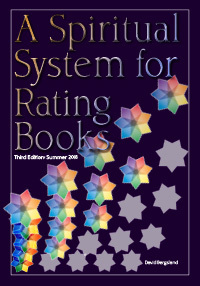 I am not sure if my curiosity for the above is explained in one of the other short stories in the Anthology, if not, it has scope for further explanation in future anthologies, as this is Volume 1 that I mention in this review. This depiction of a highly technological age that preceded the terraformation of Mars and an undetermined catastrophic event that plunged this colony into the medieval lifestyle is reminiscent of another Christian fantasy story called the Chiveis Trilogy by Bryan M. Litfin where Earth is almost destroyed by nuclear war but a remnant of the human population survive but have no recollection of the technology that preceded the war and reverts to a Medieval style of life where Christianity is lost and the main religion is satanic in origin. This is a worthy comparison as Collings’ has depicted his world with Christ. Collings has balanced the character of Alistair with that of Waleran. Waleran is confident, experienced in weaponry and warfare, is skilled in the strategy of same and is confident and loyal to a cause. He is the leader while Alistair is the follower. However, it is Alistair’s determination and motivation in the cause for seeking the cure to Lynessa’s curse that enables him to take on this leadership role when Waleran is unable to (spoiler avoided as to why this is so) and I found this twist a very satisfying one that enables the ending of this tale to happen. I loved the adventure that Collings has depicted for Waleran and Alistair in seeking the cure and having to battle more than the elements in this quest. Here, more of Collings’ imagination comes into the fore and despite the shortness of the story length, he manages to pack quite a bit of action without making this part of the plot thin or just not realistic. The barbarian type races, the dragons, and “mountable” and flyable large birds add much adventure and suspense to this part of their quest. Spiritually, Collings has depicted a rather medieval mindset in relation to the interpretation of Scripture and how they see God as evidenced by the fact that this illness that Lynessa and others have is seen as a curse from God and not as an illness that can be cured. It is Waleran who sets the record straight in outlining from Scripture itself what is the real cause and the correct character of God. Waleran is depicted as a bit of an evangelist type person in this regard and Pastor Bryan, who believes in it being a curse from God, is rather Pharisaical in his approach to this curse. However, I appreciate the inclusion of the redemptive nature of Christ’s death on the Cross in relation to this curse and various mentions of having a relationship with Jesu Christu (Jesus Christ) and living by faith in Him. It is this revelation from Waleran and Lynessa being cured and how this happens, that shows Alistair that he and his community have an incorrect view and interpretation of Scripture (pharisaical) and who God is that encourages him to let go of his bitterness and anger towards God and be restored to Him and realise that God is his Saviour and not a God who is merciless. Nice way to end this engaging short. I would love to see more of this story in future volumes of Medieval Mars Anthology or outside of this. There is a lot of potential with the world building Collings has created. If this story represents the quality that Perry and these nine authors set out to develop for this Anthology, then I am in for a real treat when I read the rest of it.